Contactors are historically the most common type of control device. Contactors can be of the three pole type, with a high ampere rating and turn on and off a large load, or an entire panel by switching the feeder on and off. Lighting contactors can also be of the multi-pole type, rated to make and break many 20/30/40 amp branch circuit loads (generally 4 – 20 circuits). Multiple contactors can be wired together for group operation. Contactors are therefore a good method of controlling blocks of similar loads. Contactors are manufactured to be operated by two types of inputs: a maintained, continuous input requires an electrically held contactor; and a momentary input requiring a mechanically held contactor. Contactors are an inexpensive, reliable, “low tech”, and if wired properly, a trouble-free method of controlling branch circuit loads. Contactors are generally easy to repair/replace with readily available replacement parts and do not require product or specific training to program, operate or troubleshoot. A low voltage relay panel is generally a factory assembly of individual low voltage relays mounted in a single enclosure with power supplies and command/control modules as required. The low voltage relays are designed to switch line voltage branch circuits (generally 12 – 96 circuits) and each relay or circuit can be individually programmed to be controlled by any number of inputs. Low voltage relay panels are a good method of controlling loads that may need to be controlled by multiple functions (an example would be a lighting circuit that is part of a time clock controlled housekeeping function; a manually controlled sales function; and a photosensor controlled daylighting function. Low voltage relay panels are a moderately priced, reliable, and after the initial programming are generally a trouble free method of controlling branch circuit loads. The low voltage relays within the panels are generally easy to repair/replace, but the command/control modules require product specific knowledge to change programming, and can be expensive (with parts delays) to replace. Smart breakers are the latest development in branch circuit control technology. Smart breakers utilize a solenoid within the breaker to turn the load on and off, without “tripping” the breaker. Therefore, a single device is used to provide overcurrent protection, and control of the breaker. 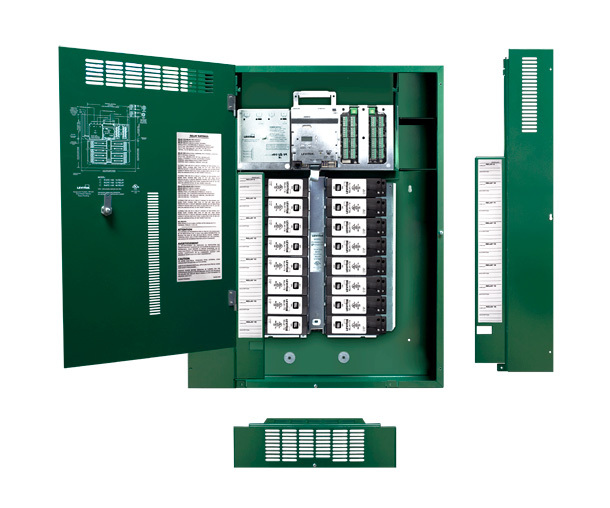 Smart breakers are mounted in a panelboard and the panel can have conventional, as well as smart breakers installed (generally 42 circuits max). Each panelboard has a microprocessor based controller which typically provides control zones, schedules, time clock functions, load tracking information and load management. The controller can be provided with software to allow PC based access to create lighting zones, on/off schedules and data collection. Often, the original programming is provided by the factory or a factory representative at the time of installation to meet the project specifications. Smart breakers are easy to repair/replace, but replacement and/or reprogramming of the controller requires specific knowledge that can complicate changes and increase costs. As building codes evolve and incorporate more energy focused requirements, the control of branch circuits will continue to increase. The requirements for controlling 50% of receptacles, daylighting, and the segregation of lighting, receptacle and HVAC loads, along with other energy conservation strategies such as demand control of branch circuit loads are currently being enforced, so all projects must be designed with a method to control branch circuit loads. While all three technologies discussed are capable of turning on/off loads, each offers an increasing level of control flexibility and control function. Contactors are reliable, inexpensive, easy to troubleshoot, and must be controlled by some sort of external signal (such as a timeclock, EMS, or photocell). Contactors however, can only control blocks of load (ie all track lights), and can therefore require lots of wall space for lots of contactors. Contactors also cannot be utilized for data collection. Low Voltage Relay Panels offer a higher tech, much more flexible method of circuit controls, which allows different blocks of loads to be controlled by different inputs, and be controlled from one cabinet, saving wall space. Programming and training as staff turnover occurs can be an issue. 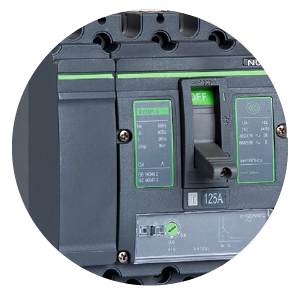 Smart Breakers offer the greatest flexibility of control, in the smallest footprint, but are typically the most expensive and complicated to own and maintain. So, Contactors may be the control method of choice for an owner with maintenance concerns, staff turnover, and a facility that does not require frequent modifications to branch circuit wiring, while Smart Breakers would offer the owner with a trained staff, planned facility renovations, or limited floor space a control method that would adapt to changing code requirements. Low Voltage Relay Panels can be a nice compromise between the two options.